If you need to update one or more of the credit cards stored in SwimOffice, perhaps because it expired, follow these steps. Sign in to your team's SwimOffice website. 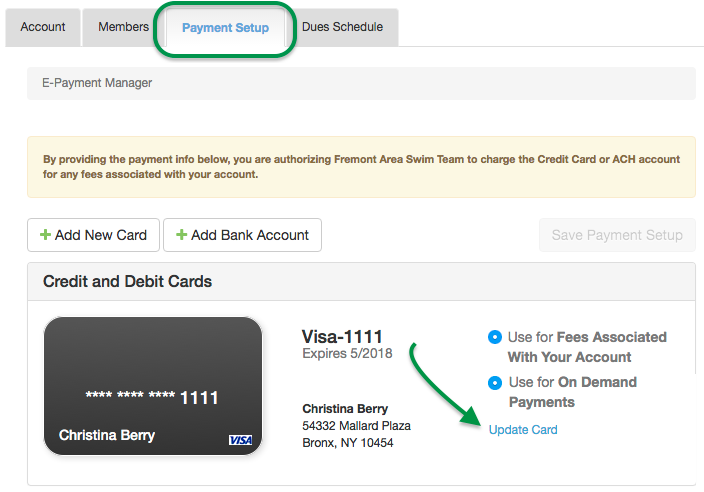 If desired, select which card is used for what fees. Click Update Card and click OK to confirm. Fill in all of your credit card information. Click Copy From Account Info to quickly add your billing information that is on file. Click Next. You have now updated your credit card. Click Save Payment Setup if needed.